Each flip flop manicure set measures 6.25” x 2 7/8”. Case is made of hot pink and black faux leather with a dual level pouch and white stitching details in the shape of a flip flop base. 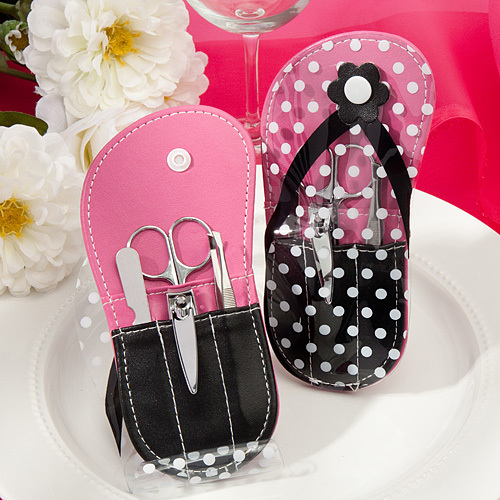 The front is clear vinyl with a silkscreened white polka dot and black flip flop strap design that snaps down to hold the tools tucked in place. Four all-metal manicure tools with a silver chrome finish, including a nail file, scissors, nail clipper and tweezers. Sets come bulk packed in a poly bag.